If you’ve ever managed or been a part of a large team, you know how irritating it can be to wait for formalities like an approval to arrive in your mailbox before you can technically proceed. Similarly in the case of reports, even after you’ve just had a presentation or discussion within your team regarding results, you need to make it formal by typing a lengthy email with a report attached and send it to everyone on your mailing list; too cumbersome and frankly unnecessary if you ask us. It would all be much simpler if there could be something more informal and personalized that could be whipped up and shared quickly eliminating all time and technical constraints. The good news is that a great app called Slack allows you to do just that! 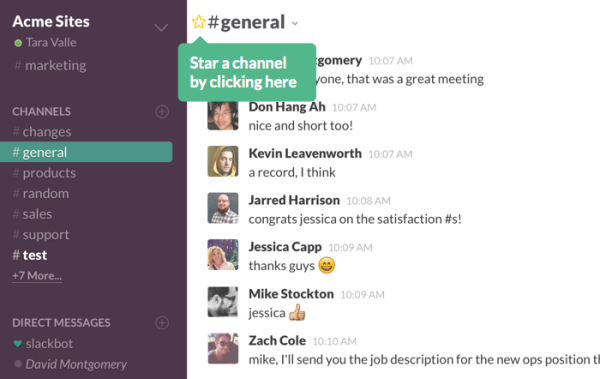 Slack – Real time messaging for corporate teams! As much as it sounds like just another messaging app, it’s actually not. This app is designed specifically for professionals who wish to make inter-team communication better and simpler. With just the right mix of messaging-app glamour and corporate professionalism, this application is well on the track to become the next big thing. Slack brings together so much in such a light look-and-feel that you’ll have a hard time initially to sink so much in. You can find something from most social platforms here – a little bit of WhatsApp (messaging groups, image sharing), pinch of Twitter (tag based topic search, referring people through @ tag) and more. Create channels (or more commonly called groups) within the team or with only a bunch of people specific to a task and communicate with them from anywhere at any time without having to be restricted to VPNs or emailing formalities. Add that personal touch through one-to-one private messages in case of sensitive matters. You can choose to create channels based on projects, teams or even a topic. Get over traditional email attachments; drag-and-drop is the way to go with Slack. Just drag a document, screenshot or report in a group to share it with all participants instantly, without having to wait for them to check their email. You can even share presentations or videos through Slack and get immediate feedback and comments on it to start a discussion. Moreover, if you use services like Google Drive, Dropbox, or Box, just paste the link and that document is immediately in sync and searchable too. Slack makes searching for items easy. Just type in what you wish to search in the search box and whether it is a conversation, an item or a person, everything will be searched within milliseconds and you’ll see the results before you in a flash. Slack automatically indexes and archives stuff to make this possible. If you frequently switch machines or platforms, you needn’t get into complications like exporting items or converting mailboxes. Slack being an online tool lets you stay in sync whether you work from your PC or your Smartphone so you can pick up exactly from where you left. Slack makes sure you never miss a thing or even be late in noticing. With custom notifications, you can make sure your phone or PC beeps every time you’re mentioned or an item is shared with you. Or if you prefer to not be disturbed, you can set that too. We’re sure that was the last item on your mind; well consider it checked too! 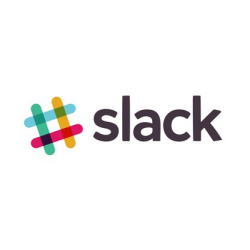 All data within Slack is encrypted (256-bit AES and TLS 1.2) on the desktop or the phone. The makers perform security testing regularly to identify and resolve any loopholes so you can rest assured that your confidential data won’t be leaked online. Aren’t you just dying to try it out? To start using Slack immediately just signup for free through the tool’s website. You’ll need to supply your email address, pick a name for the channel you wish to create, pick a URL, choose a username for yourself and you’re done! Click on ‘Explore Slack’ and you’ll be directed to the main chat-share screen where you can get hands-on action done. You can start by inviting people to join Slack or join an existing team that you know of. Thereafter, create as many channels as you need to. All your channels and people in your network will be listed in a panel on the left hand side of the window. And if you get confused about things, there’s a handy helpful tutorial to help you out. Drag-and-drop items from your PC or phone into the chat window’s text box to share instantly. If you want to browse through the files shared with you or that you’ve shared, click on a small 3-dot icon on the upper right corner of the window. This corner of the window also has a search box, an ‘@’ sign to search for conversations where you’ve been mentioned and a star icon indicating items that you’ve marked as favorite. In addition to the list of awesome features it has, the practical plus points of Slack include quick image transfer, no VPN requirement, availability in both forms – client installation as well as web tool, freedom to create as many channels as you want depending on the requirements of your team, notifications if someone on the team is online and lots and lots more. The best part of this tool is that its basic version is free for as long as you want; meaning you don’t have to pay a penny if you just wish to use its basic version. For standard, premium and enterprise (launching in 2015) versions however, you need to pay a nominal fee. But then you get a lot of additional features too so it’s a win-win deal. The only con with this tool seems to be slight connection issues on some mobile networks or client machines. But this issue too seems to be temporary so you shouldn’t really be worried. All-in-all, Slack is a great tool for collaborating with your team and inculcating a bit of informal, happy work environment setting. You actually don’t have anything to lose so try it out with a couple of teammates just for fun and experience it for yourself. Posted September 7th, 2015 in Communications. Tagged: chat, collaboration, file sharing, messaging, real time, search, teamwork. Quite a few of you reading this would be followers of the common belief that a domain that has expired or has been deleted is just gone. There’s nothing more to it; it’s just a website name which has lived out its life and has then been put to rest. However, this belief stands challenged by a service that goes by the name ExpiredDomains.net. If you simply go through this website, we’re sure you’ll discover a whole new side to the concept of domains. You’ll discover that even a domain that has expired could be used to make a fresh start, with the same name but a whole new purpose. They say one man’s garbage is another man’s treasure. Well you could imagine the same idea applying here. 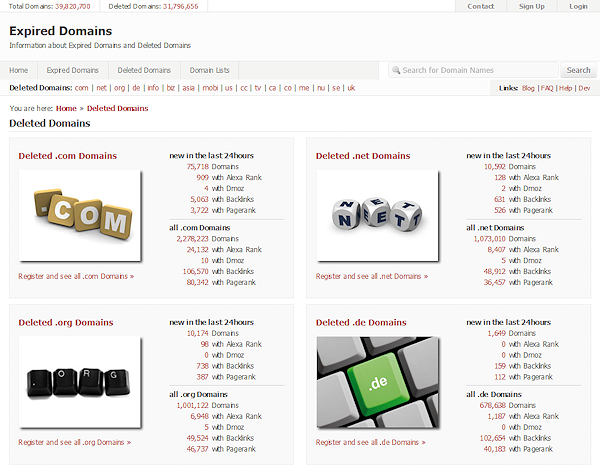 ExpiredDomains.net lists expired or deleted domains from different categories (.com, .net, .org, etc.) and different vendors (SnapNames, Flippa etc.) that can be backordered or re-registered. Numerous domains expire each day for various reasons including failure to renew in time, fulfilling of original purpose or moving on to new projects. For most general users these expired domains don’t have any value. But just like the skillful eye most aptly recognizes a diamond, expired domains present some amazing moneymaking opportunities but only to those who know what they’re worth. These people include SEO and Backlinks experts. For them, an expired domain’s backlinks and SEO strategies make it invaluable. Often, even after a domain has expired, high value links pointing to it remain alive and well. Such active links if used the right way have the potential of pushing your webpage to a much higher ranking on Google search. So basically with ExpiredDomains.net, all you need to do is know how to separate a good expired domain from a bad one and pick it up in time (while its active links are still worth it). The first look of the website is very basic which actually gets you straight to the point without any distractions. So you land up at the website, read through the basic introductions (if you want to know more) and then just click on one of the domain categories (segregated by type or vendor) to see the real action. For example, suppose you clicked on the “Deleted .com domains” link, you will be redirected to a page that lists down all deleted .com domains in descending order, that is, the ones deleted most recently (as recent as the day before) to the ones deleted up to 24 hours before and older. This list actually contains the real information. It shows the name of the domain and adjacent to it is a bunch of valuable information and statistical data about that domain which can benefit anyone who wishes to purchase it. This information includes fields like the domains PageRank (PR), Alexa Traffic Rank, DNS availability of the domain (with .com, .net, .org variants and more), the timestamp when it was dropped, a link to backorder it and more. Just hover over any abbreviations of fields and helpful tooltips will explain what they mean. While the ones deleted the day before can be found directly in this list divided into pages (there will be a lot of domains depending upon the timestamp at which they were deleted), the ones deleted more than 24 hours earlier can be found at the so called “free Memberarea” which is basically a prompt for you to register. The registration is free and a no-hassle task so you can go ahead with it if you need to view older domains. Once you’re inside the member area, you can see quite a lot of additional information about expired domains and a helpful “Introduction into the Member Area” link shows you where to find what. To reorder a domain simply click on the “available” sign highlighted in green font adjacent to it and you’ll be redirected to the GoDaddy purchase page for it. ExpiredDomains.net has some big pros in its favor. One, it quickly achieves what it claims to do. Two, it gives a potential expired domain buyer a lot of information about the domain before presenting the opportunity to buy. Three, it is one of the more reasonable expired domain backorder services present in the market. Four, free signup! All that said, there are a few big cons against it too. One, it only pulls relatively recently expired domains. So if you want to search for domains that expired say 2 – 3 years ago, you’ll have to search elsewhere. Two, you might find more user centric features on its competitors like prompts to specify whether you wish to purchase the domain as a Domain Investor / SEO expert or a simple website owner. Three, you’ll find that additional popular features like domain auctions, domain brokerage etc. are missing from ExpiredDomains.net. And finally, it could sometimes prove to be beneficial only if you want to search for free domains. 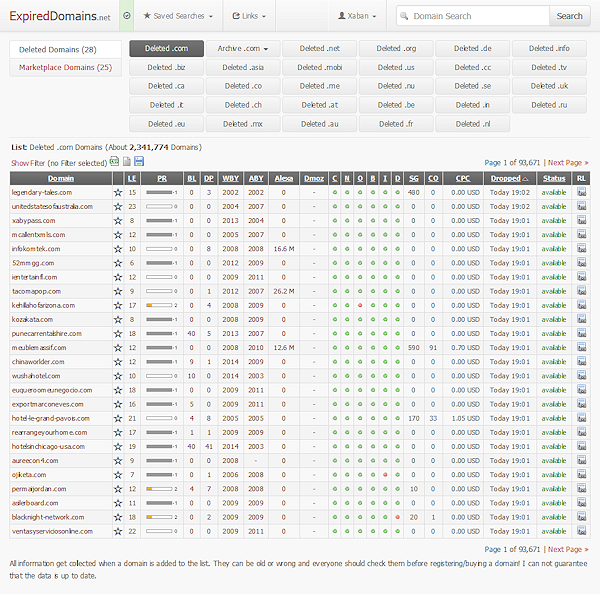 All in all, ExpiredDomains.net is a good place if you need to find quick information on deleted domains for free. It brings together quite a lot of data at one place enough to act as a one-stop solution for experts on the matter. Plus, you can view most of the information and even place reorders for recently expired domains without even having to sign up. If all this satisfies your purpose, this is what you should be using. For advanced features like domain auctions or more buyer preferences, you should scout for other services. Posted June 4th, 2015 in Domains. Tagged: auctions, domain names, Domains, expired, search. Knowem.com, a well-known platform for social media marketing is a hit these days and with the growing online market place and your target buyers spread across the globe it is becoming very essential to know and understand the various purpose, name and domains for all the popular platforms for Social Media Marketing. 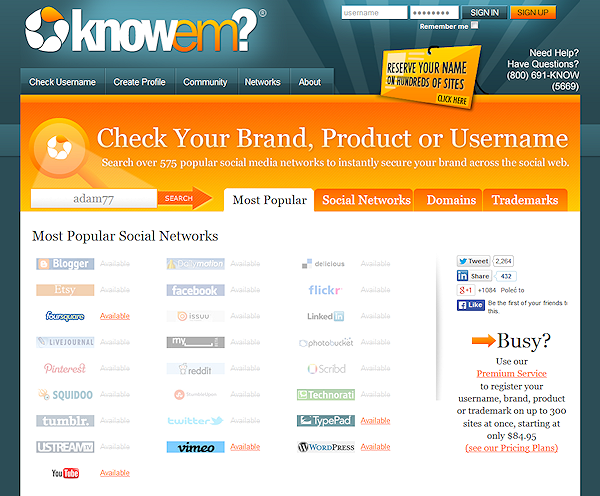 KnowEm allows you to check for the use of your brand, product, personal name or username instantly on over 500 popular and emerging social media websites. Grab your name and secure your brand before someone else does. Search over 500 popular social networks, over 150 domain names, and the entire USPTO Trademark Database to instantly secure your brand on the internet. With the help of notifications, the convenient and simple platform allows the ease and swiftness detecting the communication of your brand power. Users that share opinions, join groups, hold events and participate in contests conveniently and using usernames and domains. Acts like a well-established Advertising platform, could also increase your brand awareness significantly within your target audience by the single establishment of your brand. Thus allowing you to further develop and maintain professional relationships, definitely does more than what exchanging business cards can do and that to by scanning through and co-relating your social presence online and securing your identity efficiently. Provide necessary and extensive information in your profile and get yourself actively involved to publicize your current identity. Increase possibilities to get identified. Serves to help individuals and companies to build and maintain brand value. This gives professionals an advantage to be more successful and productive in their careers by leveraging on as well as contributing there to own professional and trusted network. Allows customization of profile and integration of features such and blogs, groups, bulletins, widgets. It seems to be widely used by the industry professionals that focus on building a social image even artists like musicians, bands and comedians. Subsequently, it allows the rise of independent brands by providing a platform that by passes the big players in the industry. It has evolved into a powerful social medium as a great and extremely fast way to disseminate information. Talk about the grape-vine, indeed illustrates the meaning. Knowem has an effective navigation as it easily determines and allows visitors surf and navigate your social sites without any reference. It’s the most comprehensive cross-platform examining the common social interface patterns anywhere. Design engaging and usable interface instills more user confidence and less guesswork. The site focusses on design concepts such as affordances, visual hierarchy, navigational distance, and the use of color to polish the look and feel of the site for user-friendly interaction. Suitability to online social connections when it supports the user in the effective and efficient completion of the task also is extremely self-descriptive. The site is immediately comprehensible through feedback from the system or is explained to the user on request. Allows the user to initiate and control the direction and pace of the interaction until the point at which the goal has been met. The site meets suitability for individualization and is capable of individualization when the interface software can be modified to suit the task needs, individual preferences, and skills of the user. It supports and guides the user in learning to use the system as well. The site has an effective representation with attributes such as clarity as the information content is conveyed quickly and accurately. The displayed information can be distinguished accurately while the users are not overloaded with extraneous information at the same time offering a unique design with Legibility making the information easy to read. The beautiful grey confirms – it is conventional, dependable and practical. It is a color of information technology and responsibility, associated with the gray of experience and dependable attitude. Thus making this site a very attractive and thought after platform. The bright orange simply makes you feel welcome that the site is here to help. The site has a top right corner with sign in and sign up tabs that allow you to easily log in to your brand account. Below that adjoining the left corner lies the information bar with tabs offering information about the site and major tabs like create profile and check username, a facility that allows you to find all your social connections and the current page work at each platform. The bar also has tabs that showcase the Knowem family of networks and communities. The site is well connected with the world’s best and most popular social media platforms such as Facebook, Twitter, Blogger, Behance, Tumblr, E-blogger, WordPress, Adsworld, Etsy, Fiverr, Elance, LinkedIn, Deviantart , Answers.com, Blurtit, Wiki How, Wikipedia, Webs, Buzznet , Hype, Soundcloud, Flickr, Photobucket, Shutterstock, Shutterfly, My Opera, Trippy and YouTube the biggest video library. Social media marketing can seem like a fragmented, disjointed thing. That’s natural, especially if you’re involved on multiple networks. Using Facebook, Twitter, G+, LinkedIn and other networks individually can be difficult and it can seem like you’re just fragmenting your marketing efforts. It doesn’t have to be that way, though. With the right steps, you can secure your brand on all social media platforms together. Not only does that offer better ease of use for you, but it can ensure that your audience is fully engaged helping you build connections across all of your networks. If you haven’t looked into the various social media Identifiers out there, you’re missing out on tools that can offer convenience, time savings and even the ability to provide you with metrics necessary to measure your effectiveness and reach. You might think that the only way to use those networks is through each individual website. You head to one platform then to another and then hop over keep jumping to learn about your social media interaction. Just thinking about it is exhausting. Who has the time? No one does. Thankfully, there is a way around this. 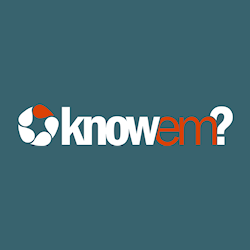 Know it all at Knowem, the ultimate platform to know about all the social media info of single or multiple usernames and domains. Knowem Now! Posted November 26th, 2014 in Social Media. Tagged: available, brand, domain, login, search, trademark, username. Promoting your company through blogs, podcasts, video, newsletters, SEO, eBooks and Social Media is called Inbound Marketing. The ultimate purpose of inbound marketing is to bring customers closer to the brand. Inbound marketing earns a lot of attention from the customers and makes it easy for them to find your company. It helps you to get new customers through the interesting content you would post on your social media, blogs, newsletters or more. Marketing Analytics is another concept that is very essential for your business or company. It comprises of all the technologies and process that would allow you to evaluate the performance of your marketing campaigns and initiatives. 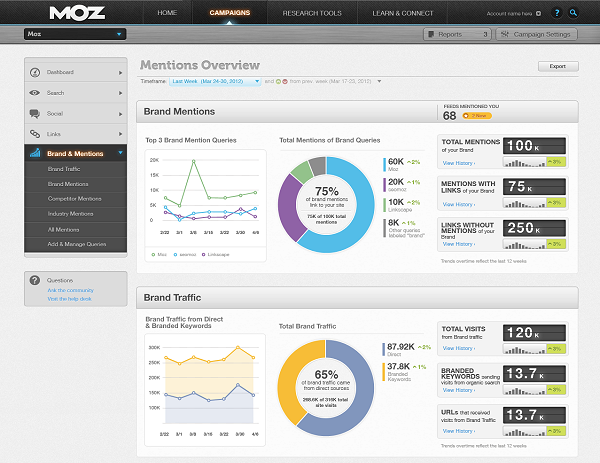 Moz (Moz.com) is one of the most popular companies offering Inbound Marketing and Marketing Analytics. This company is based in Seattle, Washington, U.S.A. and was founded by Rand Fishkin and Gillian Muessig in the year 2004. Founded with the name SEOmoz and as a company that would deal with Search Engine Optimization in the year 2013 the company expanded its business to Analytics, Social Branding, and Link Building. It also acquired GetListed, A Portland based company that helps local businesses get good serach engine ranks. 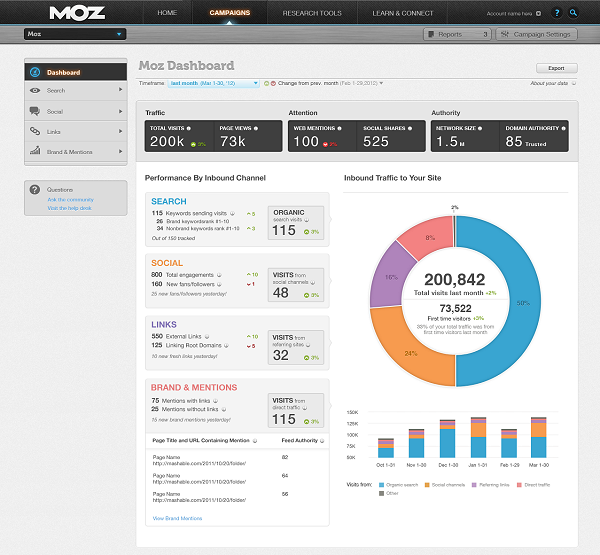 Moz.com gives insights to social media, search engines and link building efforts. A premium Moz account would help you know the organic search engine rankings and take necessary steps to increase the same. These tools would help you know what changes you need to make on your website and content concentrating on the keywords, web page optimization and link building. Moz Analytics is a marketing analytics software that gets all the inbound marketing data in one place with beautiful custom reports and insights that help you while researching the actions and changes you should take to improve the performance of your website or blog. It shows how your presence on social networks is impacting your Search engine rankings. It also shows you through what medium your content is being shared on the internet and what gets you more visits on your website. Competitive analysis with your competitors can be one of the key to your success at Moz as you know where the competitors are getting visitors from and you would know where you need to focus to outpace competitors. This allows you to keep a check on how your business is listed on various search engines like google, Bing and other local serach engines. This helps you in improving your business listings and increase your business. Followeronk gives you a deep insight into your twitter accounts and lets you know who follows you, gives their locations, their Tweet timings so that you know at what time you should tweet to attract more people to your content. Using Followeronk you can search new influencers in your niche and can compare you social insights to others so that you can take necessary actions to beat the competition in your business. This tool compares the backlinks on your website with your competitors for targeted and intelligent link building. It identifies popular pages, gets social activity data and analyzes the anchor texts. This tool is mainly used to research and perform link analysis. Mozbar is an SEO toolbar that you can use to view your link metrics, access all SEO tools that you like at a single place while browsing the internet. It also allows you to analyze a webpage and gives Search Engine Results Page for a certain query. Mozcast on the other hand allows you to track changes and fluctuations in the google rankings on a daily basis. Apart from these basic free for a month tools there are certain tools which are available on Moz only to the Moz Pro subscribers. 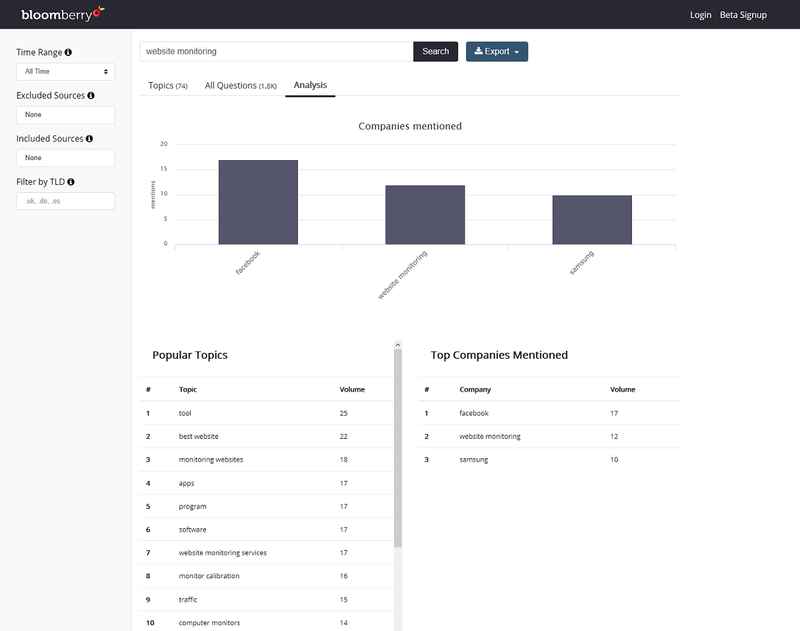 This tool is used to analyze the mention of your business and competitors on the web. It also finds out the latest trending content in your niche that is published on the internet. This uses Freshscape index that contains over RSS feeds and over URLs. Knowing who is talking what about your brand on the website helps a lot in getting customer and visitor feedback so that you can make changes accordingly. This tool informs us about the web page rankings and also about the keyword rankings and stores them in a format that you can compare the previous and current rating easily. This gives you insights about keyword usage on your page and helps you to rank higher by optimizing your content accordingly for targeted search terms. It is a tool that lets you know how difficult it would be if you want to increase your ranking based on certain specific keywords that may have been used on 10 competitors’ website. Crawl Tests unleash the crawler called RogerBot on any URL and it detects the HTTP status codes, Content type, Metadata and other issues which may interfere with how the serach engine bots crawl a website. The reports hence generated are sent to your registered email. Whiteboard Fridays are the videos created by the Moz team in which they illustrate the SEO related concepts on whiteboards every Friday. Moz Community includes Webinars, O&A sessions and Events which are organized by the Moz team to deal with issues that usually people face while performing SEO and optimize their websites. The Moz Pro subscription costs around $99 per month and offers basic free tools and premium tools too. This package includes all the tools listed above. The website also offers a 30 day free trial which doesn’t includes the premium tools which were listed above. 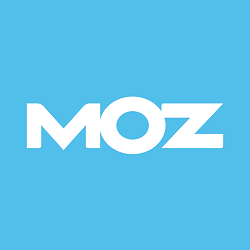 Moz Local is available in a different package which costs 49$ per year for a single location. Now if you want to have wonderful conversion rates and rank higher on Google and other search engines, I would recommend you to try Moz.com as it is one of the most awesome online tools which is priced appropriately and you would surely get the desired results within a small span of time. Posted April 14th, 2014 in SEO/SEM. Tagged: analytics, link analysis, links, mentions, moz, open site explorer, rank tracker, rankings, search, sem, seo, serp, social, traffic. A process of affecting the visibility or ranking of a website on a search engine’s natural or organic search results is called as Search Engine Optimization (SEO). Search Engine Optimization involves consideration of how a search engine works, what words/keywords are being searched by people and which is the most popular search engine among the audience targeted. SEO not only includes editing of the content on a website but also includes the editing of the related coding so as to increase traffic to the website by having specific keywords and barriers to the search engine indexing removed. Now, Search Engine Optimization is a huge task until you know everything about SEO and have a chalked out plan for having many visitors to your website you’ll have to compare performance of keywords on your website with your competitor’s and not only this you’ll have to know how these search engines index pages through bots, crawlers or spiders and have a perfect analysis of the performance of the website and where do you need to improve. This may sound too vast and gigantic right? and you must be thinking of hiring an expert…. Here I introduce you with an application for performing all the SEO related tasks which may sound more like a magic you can enhance your website rankings easily without any hassles with this app called Positionly. 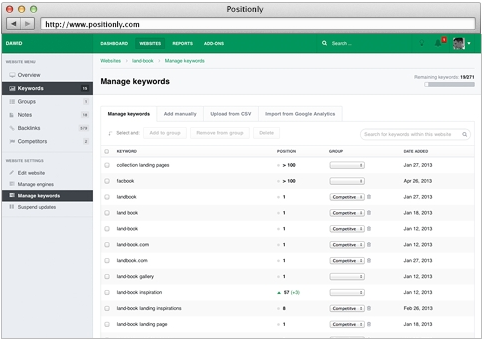 Positionly is a tool that monitors your website. It includes a user friendly dashboard which shows website stats, keyword position data and density, website performance graphs and more. Position changes related to a keyword can be easily traced for your website content. It allows people to bunch or group together different keywords to enable easy tracking of similar keywords with high density. This application drills deep into popular search engines and tracks changes in the website indexing tactics by the search engines easily. And yes, you don’t need to know a single thing about SEO! Positionly does it all. Positionly can be used together with a Google Analytics account and develop a plan or strategy for SEO of your website. It is very scalable that is it can be used by a single person to track single website and it can also be used by large companies to track performance of multiple websites. Positionly takes a huge amount of time and efforts in the beginning to show results you won’t see the #1 position in a day but it’ll surely increase the website performance and would help enhance your website eventually leading to the #1 tag but as said earlier it requires you to put in some but lesser efforts with all the complex tasks done by Positionly. Positionly not only simplifies the SEO process but also makes it interesting and one loves the whole Positionly experience. 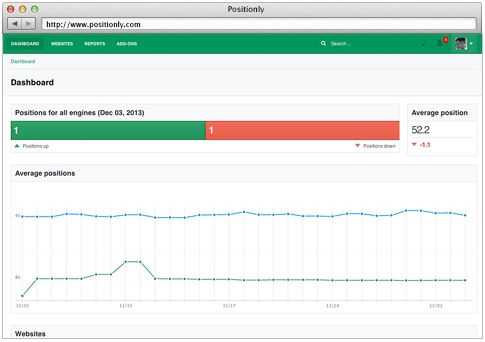 Once you enter your web address and associate your Google Analytics account with Positionly it would automatically trace top 50 keywords, giving you links to all the sites backlinking to your website it would help you monitor every single change to your ranking on any search engine using the deep statistical analysis. Once we are aware of the different rankings of various keywords which are put up in a more logical manner in comparison to Google Analytics so that we can focus on keywords with the capacity to bring in more traffic and get our website listed on the first page of the google search results. You can sign up for this awesome service using your Facebook, Twitter or LinkedIn accounts. After signing up you need to add your domain name as described above and Positionly would retrieve your website information like the main title, header, footer etc. Even maps and videos can be included in the results you get through Positionly. Now, you’ll be adding the desired search engines like Google, Yahoo and more. 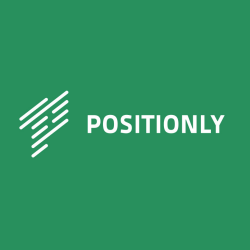 One advantage of using Positionly is that it includes the location specific search engine versions as well like Google Australia, India, Japan, UK and even Bing can also be integrated. Ability to link up with many search engines makes it more powerful tool. Positionly takes approximately a day or two to analyze the keywords after which a list which includes all your competitors should turn up and there would be a brief description about your performance as compared to theirs. You can also add URL’s on your own although the results won’t appear instantly and you’ll have to wait. Detailed reports and Simple report can be generated based on the competitions and line charts would also be developed based on this data. Link and Traffic reports are also provided which don’t offer comparisons. The reports can be generated in CSV or PDF versions using generate report button and exporting it. You can set up your Positionly account on your iPhone or notification updates on your computer, tablet or phone using RSS feeds. It can also be used in integration with Google Analytics new alert system which may help you a lot and ease the SEO process. Keyword tracking and tracing can be simplified using Positionly which has a simple user interface and awesome user experience. Positionly offers four plans for $19 which includes 50 keywords and supports 5 websites and 5 competitors, for $49 which offers 250 keywords and 10 websites and competitors, for $99 it gives you 1000 keywords with 20 competitors and multiple websites and for $199 you get 2500 keywords with multiple websites and 20 competitors. Besides these you can also sign up for a free positionly account which would offer 14 days free trial for every feature and this doesn’t require a credit card. Launched in 2011 by Adrian Duli, Grzegorz Kazulak, Piotr Chmolowski and Oskar Krawczyk. 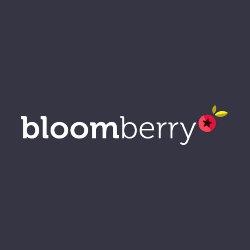 This app made a huge impact on the users on the World Wide Web. With no noticeable shortcomings and a wonderful user interface Positionly is being used popularly for its efficient way of tracking or tracing the website keywords. Posted January 20th, 2014 in SEO/SEM. 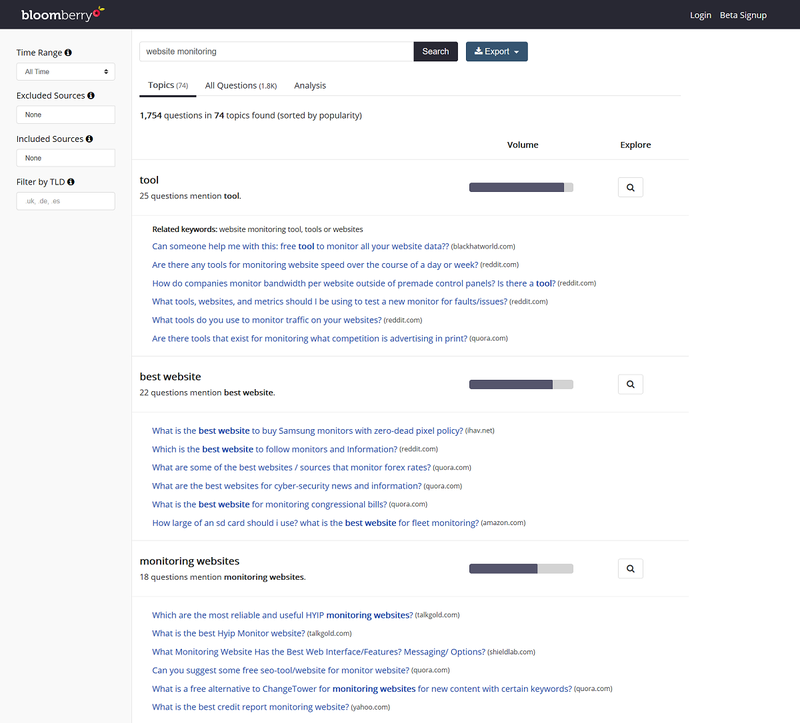 Tagged: dashboard, google, keywords, monitoring, positions, rankings, search, serp. Watchyourfeed.com just started to publish very interesting data. Every morning they check what are the top searches (queries) on Google and Yahoo. And then they search for these phrases in top news websites feeds. The result is a list of top articles from top websites on top subjects. Posted April 29th, 2011 in Statistics. Tagged: articles, content, news, search.